We installed version 1.9.73 of the WPtouch IPhone WordPress Plugin on this site over the weekend and couldn’t be happier with the results, so far. 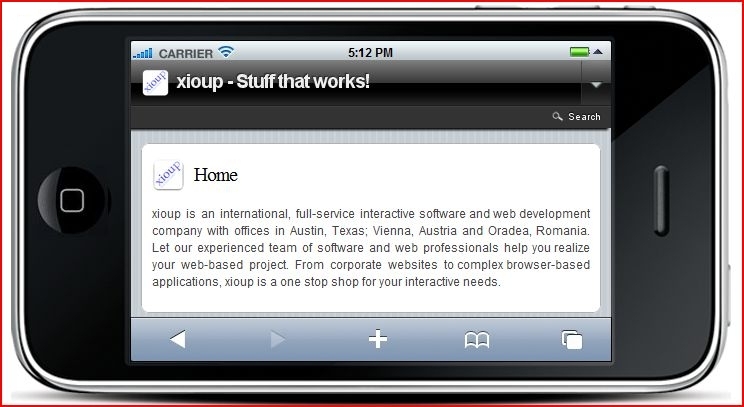 This is how the xioup Home page looks on an IPhone, thanks to WPtouch. Rating: 5/5 (A Plugin that works!) – We’re extremely impressed with the quality of the plugin – it looks like the guys who developed it, over at Bravenewcode, really know what they’re doing. 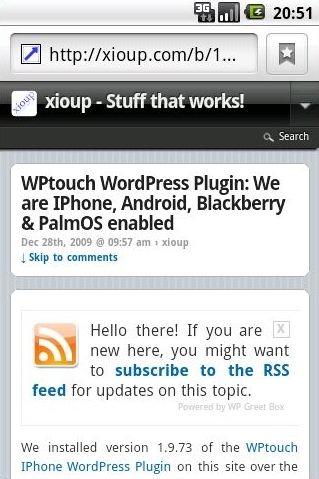 In a Nutshell: The WPtouch plugin serves a stripped-down version of your WordPress site that’s crafted to work on the most popular mobile devices. It cuts down file sizes, requests and load times for viewers using one of the target devices. Out of the box, it delivers an IPhone-themed version of your site, but you can change the look and feel of the theme via the plugin dashboard and/or modifying the CSS, if you’d like. How this web page looks on an Android emulator, thanks to WPtouch. Installation & Activation: A snap via the WordPress Dashboard. Configuration: The WPtouch Dashboard contains a bunch of configuration options, all very well explained and documented. You’ll want to spend some time looking through these options closely and testing the results on appropriate mobile devices and/or emulators to make sure everything looks right. Advantages: Highly configurable, easy to set up, has excellent documentation, does what it says and is mostly compatible with almost all of the plugins we’ve tested it with. Drawbacks: Incompatible with DISQUS Comment System. 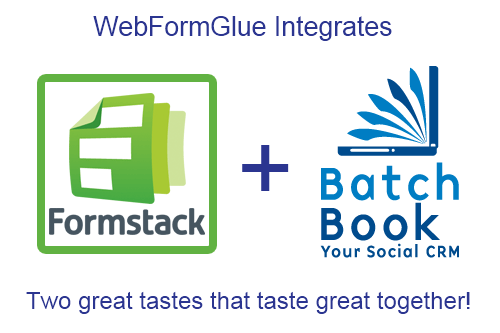 Requires workaround to be compatible with WP Cache / WP Super Cache. Not completely compatible with some other plugins, but doesn’t interfere with them, at least. Thesis Theme – 100% Compatible! WP Greet Box – 100% Compatible! Parting Notes: We’ve only tested the site in an IPhone and an Android emulator, so far. If you’re using a mobile device or emulator to view the site, let us know how it looks!